It was a fantastic experience to perform in the Dream of the Red Chamber opera at the Hong Kong Arts Festival this March. 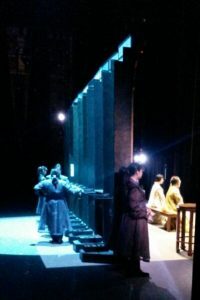 Though I am not an opera singer, and had the glamorous job of moving tables, beds, and the heavy yellow palanquin, it was an educational experience to be backstage. 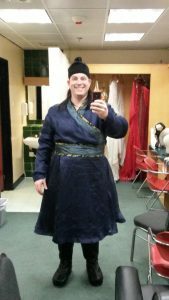 I guess technically I played a servant- they even made me shave my beard and put on a wig- but with no lines and no stage time other than moving things, I was only marginally separated from the running crew. I was particularly interested in how the stage managers organize the production crew for maximum efficiency in a huge venue. The production stage manager stat in front of a cabinet of monitors stage left and orchestrated the show through a mix of microphones, shouted commands, and sign language. 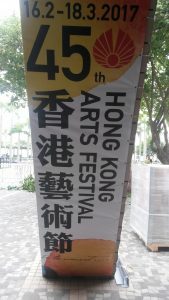 Both performances were sold out and it was thrilling to be part of the final production of this year’s Hong Kong Arts Festival.